I think writer’s block is only a problem if you’re afraid to begin. “JUST BEGIN!” I tell students in any writing class I teach. “Write any old thing at first,” said my hero Brenda Ueland. “Be a lion! Be a pirate!” in your writing. Put anything on the paper to get the waters flowing and the mind inching along its little pathways. She said too that you should picture someone who loves you listening as you talk. I was the baby in my family, the amazing good news at the end of all that bad news, my mother abandoned, my father four states away and not coming back – and that was all before the real ugliness started. But then this baby got born at the end of that bad period and our whole houseful of five oldsters just melted. “Look, it’s a BABY!” they said to each other as if they were expecting maybe a mole. And then there was the added darlingness of my sister Nan who was also just a toddler and the next thing they knew they were all laughing at the dinner table again, same as always. I really do just picture those kind faces when I sit down to write. Or else I picture David who may love me too after all these years because why else would he keep shaking his head and saying “TT! Old TT!” as he did again the other day when he caught me picking cherry pits up off the floor with my toes. “I’ve decided not to bend over more unless I’m paying someone to MAKE me bend over” I told him. I meant in Hip-Hop Cardio and all those other dance classes I take at the Y. “You want me to be in shape, right?” I added. Who wouldn’t feel happy with someone like this in their life? 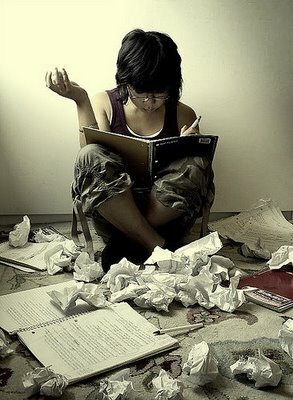 With writing, the real main thing is to stay calm and remember that you know how to do this. Just talk in your own voice. I mean don’t you feel sorry for the young woman at the top? She’s bound to panic and freeze, panic and freeze; that’s what I think looking at this picture, since it appears to be a sort of term paper she’s working on. Take notes on all those books on good big index cards, then set the books aside, deal the cards out on the floor and walk all round them until you figure out what order you want to put them in as you spin out your argument. I have more tips but I’ll save them for the next time. Time to go do my pale imitation of Julia Stiles in Save the Last Dance at the good old YMCA. I used to brush my teeth endlessly while putting off the inevitable. It’s amazing the number of little jobs you can do before settling down to write that dreaded paper. I was the world’s biggest baby about getting down to it on college, I whined and procrastinated, whined and procrastinated maybe because before I got there I’s been such a total workaholic. What a rest college is, compared to the 1,000 hoops they’be got you jumping through in high school! Like you said, finding your own voice is a BIG key, at least it was for me. Trusting that voice is another, especially if it sounds different from the norm. Sometimes that can be even more difficult. But once you do, the rest is easy and the ideas just show up at your door…sometimes. Other times you have to go out and drag them in for supper. But those often turn out to be your favorites. I wrote about my own amazement of the writing process back in Sept when I put up my paltry (compared to some) 70th post. Here it is if any of the “Marauder’s” would like to check it out as an addendum to yours. cause its closing time and love’s for sale tonight at this five and dime. Ah I love that song! Who wrote it Art? I know only Nancy Griffith’s version which is here. The song also goes by the title “Love At The Five and Dime,” which is actually Woolworths. I’m familiar with the Nancy Griffith version which was probably more popular at the time of its release. It’s great, but I’m also into the folksy, sometimes mournful sounds of Mattea Mania. I don’t know who wrote the song but it is sometimes confused with another “Dance A Little Closer” song from a musical of the same name. This Broadway bummer got terrible reviews but strangely, the title song was written by Alan Jay Lerner of “My Fair Lady” fame. Back to our song. Ms Rita had an exciting life. Married Eddie, ran off with a drummer, then back with Eddie. Poor Eddie! Traveled with a barroom band, till arthritus took his hands…now he sells insurance on the side. Ms Rita’s got a house to keep, she writes dime store novels and love so sweet. Yet, I think they are getting by quite well. They dance to the radio at night! A romantic thing to do, in my view!